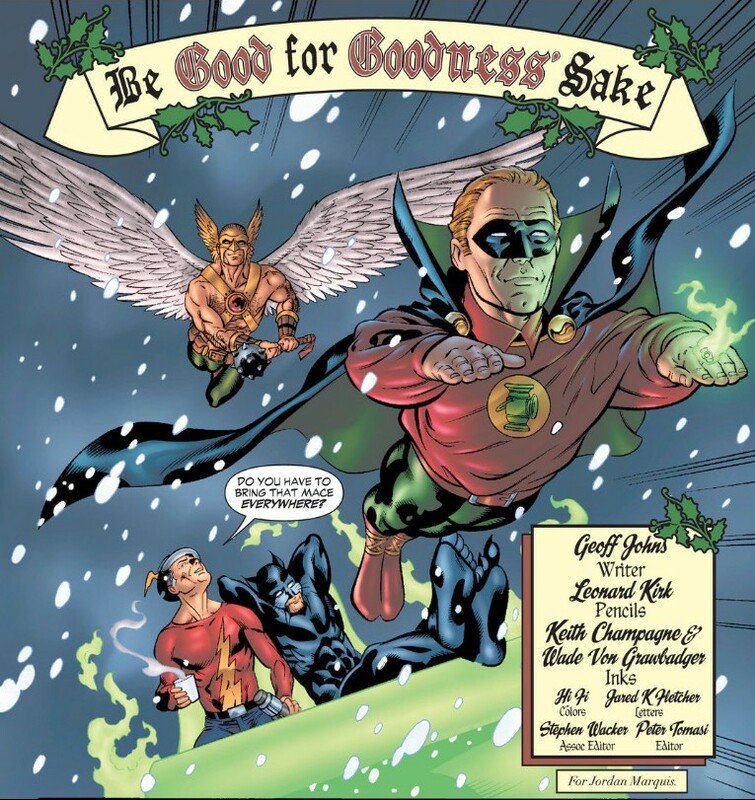 Have Yourself a Merry JSA Christmas! “JSA” No. 55: And Santa Claus is hiding a secret. You don’t see a lot of super-hero holiday stories these days. They were once a staple of the industry, but they mostly seem like a thing of the past. On one of the many Facebook groups devoted to old comics, a fan objected to an issue of “DC Comics Presents” that teamed Superman with Santa Claus. He didn’t like seeing his hero with a fictional character – completely missing the irony. But there’s a truth here. Sentiment and sensation rarely mix well. So finding a story that not only tugs at your heart but resolves the fate of a beloved Golden Age hero not seen in decades? That, my friends, is a holiday miracle. Silent Night, Mighty Night: The Big Four off to see Santa. In “Be Good for Goodness’ Sake,” in “JSA” No. 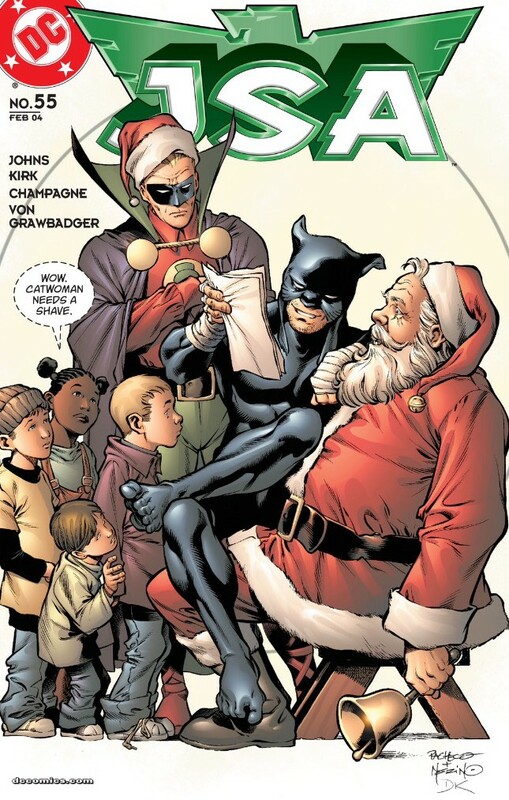 55, cover date, February 2004, the Justice Society of America’s Big Four – Flash, Green Lantern, Hawkman and Wildcat – are making their annual Christmas Eve trek to New Hampshire to see Santa Claus. Maybe they’re going to sit on Santa’s lap and ask for better retcons. Wildcat is hilariously horrified to realize he’s spending yet another holiday “trapped with the old prudes of the JSA. Flash reminds Wildcat this year is different: This year they have good news. Appearing at the same mall – a gang of armed thugs who are definitely on the naughty list this year. She knows if you’ve been good or whether you deserve a pop in the face. But they haven’t reckoned with the JSA – and this mall’s holiday help. 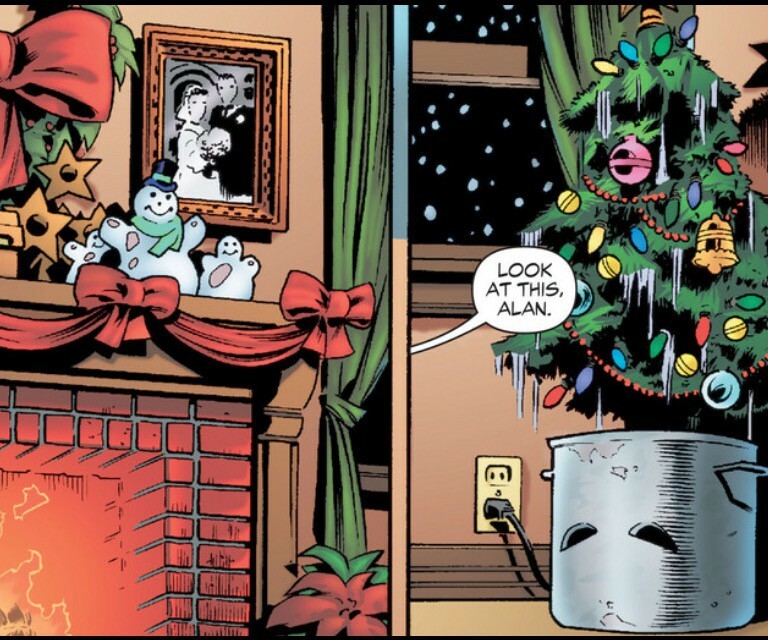 Under Santa’s fake beard is Abigail Mathilda, better known as Ma Hunkel, better known as the original Red Tornado. Disguising herself with a large pot over her head and colorful long johns, she fought crime in her working-class New York neighborhood during the 1940s. 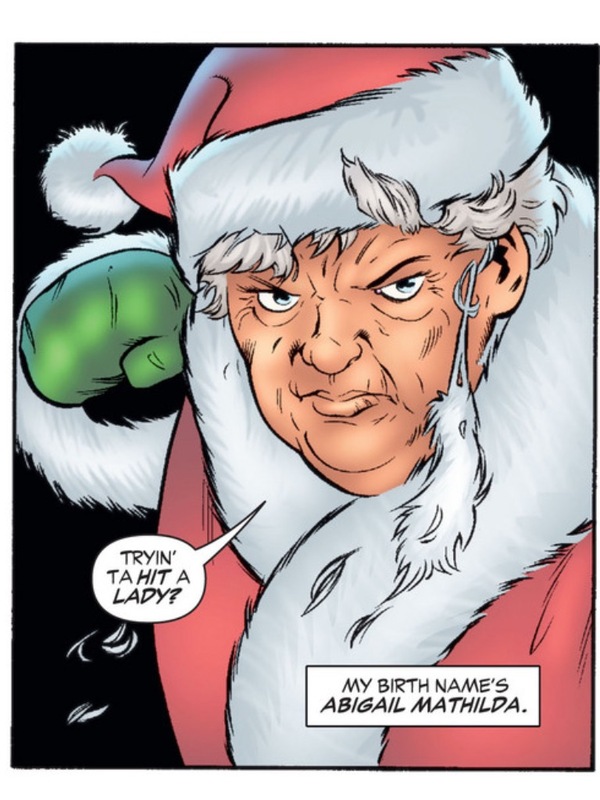 Stocky and brawny, the Red Tornado was often mistaken for a man – and writer Geoff Johns’ decision to have her first appear here dressed as Santa is a nice nod to her gender-defying roots. 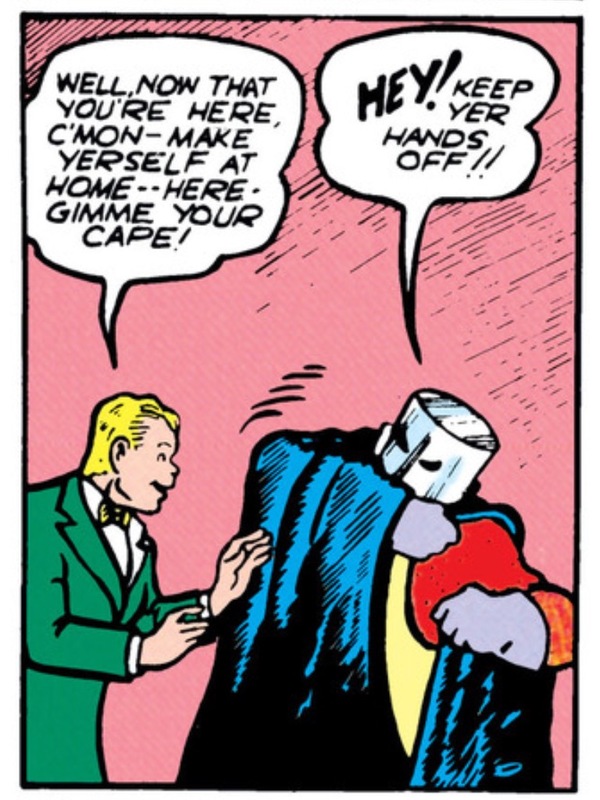 Why sew a mask when you have a perfectly good pot in the pantry: The Golden Age Red Tornado in action. Ma might be forgotten today were it not for her cameo in “All Star Comics” No. 3 in 1940 – the first recorded meeting of the world’s first super-team, the Justice Society of America. 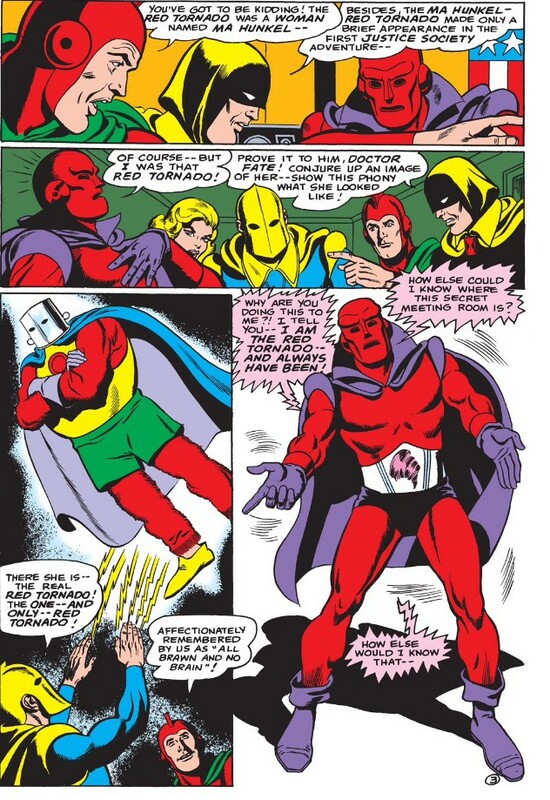 The Red Tornado brushes off a grabby Johnny Thunder in the legendary “All Star Comics” No. 3. She came up the fire escape and through a window – and then almost as quickly left, to the puzzlement of the assembled heroes. Flash discovered why she left in such a hurry – she had torn and lost her pants on the fire escape. Her sole “All Star” appearance was enough to leave fans wondering for years about her status with the team. I knew Ma Hunkel, and you, sir, are no Ma Hunkel. The arrival of the Silver Age Red Tornado in “Justice League of America” No. 64, cover date August 1968, complicated the mystery. The android claimed to be Ma and had intimate knowledge of the Earth 2 team. The JSA immediately detected a ruse – well, you didn’t need the powers of Dr. Fate to know he was a fraud – and later learned the android had been created by their foe T.O. Morrow to destroy them. Johns answered the questions fans had been debating for decades. As revealed here, Ma has been in the federal witness program for 53 years after testifying against the Yellow Mask Mob. 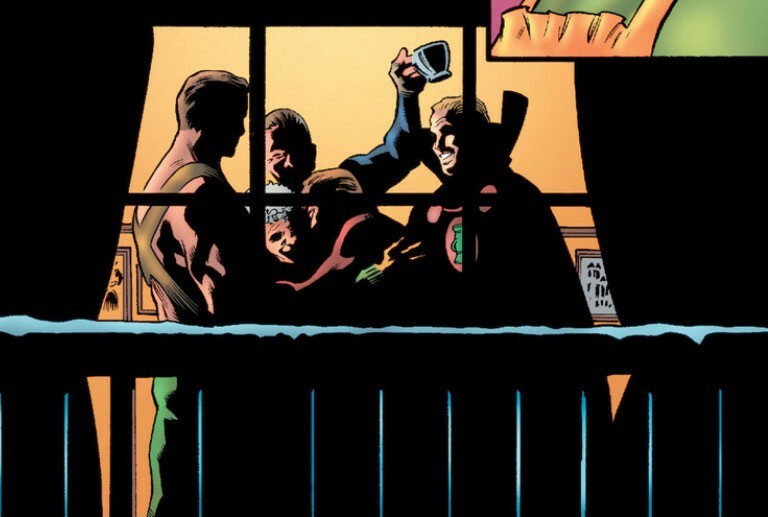 But once a year, every year, on Christmas Eve, the JSA checks in on her. This reunion is especially happy. Maybe Ma is just feeling pumped after helping the team take down those hoods. Remember, kids: Always keep your favorite pot/helmet by the Christmas tree so Santa knows you have been good. “You did just fine,” Green Lantern says. Ma is still one tough cookie. She scolds Wildcat for putting his feet up on the furniture and later practically freezes him with a glare after he balks about letting a lonely Hawkman help out at his gym. She could probably cow Darkseid with that stare. Flash breaks the news: The last living relative of the Yellow Mask Mob has died. 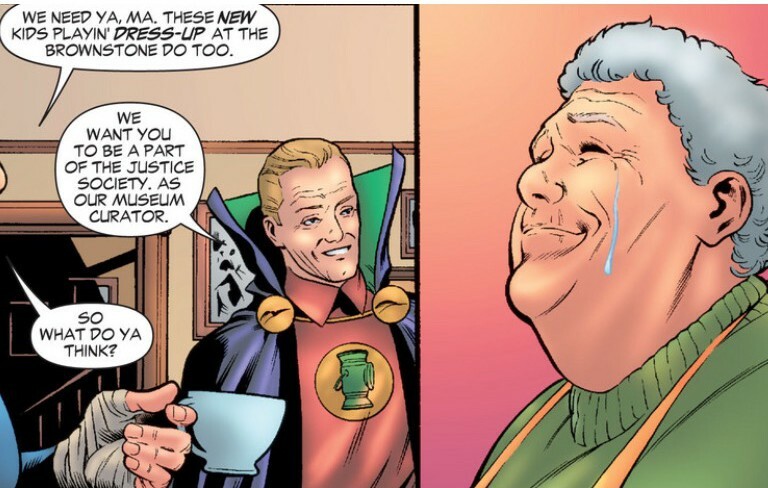 – and they want her to join the Justice Society as their museum curator. Ma settles into the brownstone. She helps Star find her cosmic converter belt. She advises Dr. Midnite about the healing powers of chicken soup. She puts on the kettle so Power Girl can vent about her day. The woman who donned a pot over her head to fight the neighborhood thugs and lost more than 50 years of her life now has a home and a family who need her. And what more do you need from a Christmas story? This was another stand-alone tale – and one coming a month after the JSA’s hilarious Thanksgiving disaster. Two holiday issues in a row? Johns’ writing has never been so moving. It’s been little more than a decade since this story appeared, and the industry has changed so dramatically. I can’t imagine a story like this getting printed today. Carlos Pacheco’s cover is a humorous twist on Norman Rockwell imagery, and Leonard Kirk and Keith Champagne’s rich inking set the mood. You can find this story, of course, in the DC comics app and in the trade paperback “JSA: Princes of Darkness.” And check out the original Red Tornado in all her Golden Age glory in “JSA All Stars Volume One,” a DC Archive that collects Ma’s first stories as well as those of Hourman, Dr. Midnite, Mr. Terrific, Atom, Johnny Thunder and Wildcat. It’s an absolute treasure, and maybe if we all live long enough, DC will bless us a volume two. And may all our holidays be filled with great JSA stories. But think about it: Reddy 2.0 isn’t male. He’s a machine shaped like a man. It’s like me naming my microwave Teddy. And I kinda love that Ma existed in the 1940s and was never a Phantom Lady clone.